Proekspert believes the best approach for continuous optimisation in the IoT era, is automated learning from manufacturing data streams. Using state-of-art science and technology, we fuse the data that’s collected to build robust optimisation models tailored to specific business needs. An effective analytics model will be built around a specific business question and have a reliable dataset as its foundation; to incorporate such a model into the manufacturing process will require integrations. Although the building and integrating of these models can be expensive, the cost is offset by the saving on not having to repeat large quantities of work upon the discovery of a new available dataset. In response, we have created an analytics excellence deployment tool: simFactory. It addresses the complexity of analytics development and implementation by enabling a fast and efficient workflow to prototype and validate analytics models, all without the need for costly implementation and deployment. We use a cloud based approach, because it allows us to visualise and continuously improve the models with ease. They can then be made available for the shop floor operators anytime, anywhere. Here’s a brief overview describing the five-step sequence for defining the business question, developing and validating a meaningful analytics model and enabling a continuous optimisation process. Start agile, regardless of whether the digitalisation strategy in your company has been finalised – fast prototyping provides valuable input for strategy as well. We always use a ‘design thinking’ approach, starting with a simple workshop where urgentissues, bottlenecks, and the emerging business question can be shared. The workshop is also an opportunity to define KPIs as well as evaluating expected impact, increases in efficiency and quality, or the reduction of costs. Of course, we’ll give meaningful input wherever possible. Through our focus on electronics manufacturing, we’ve already identified 95% of business questions we could solve using advanced analytics. After defining areas for improvement, it must be understood which dataset is required and which is available – or perhaps most importantly, accessible. Sensors, machinery and business systems will be listed, and the integration level will be defined. Initial problem discovery and analytics model prototyping is a relatively straightforward process, with often a limited dataset in .csv format being sufficient. Over a longer-term perspective however, permanent integrations need to be considered to meet the needs of real-time decision support. This could mean the acquisition of new solutions, machinery or lines. To maintain the capability of making swift changes to factory configuration, open API based integrations are essential. Integrations and data collection without a purpose is a luxury. Therefore, it’s crucial to start working on data that already exists first, then decide how to move forward incrementally. Before we tackle complex integration developments – or even start data collection – we use available data for our analytic model prototypes. During prototyping we structure and prepare the data, making it suitable for automatic processing; for the fusing of different data sources, and to develop initial models and visualisations that will assist us in seeking answers to the business questions. These models can be iterated and validated quickly with the business owner as many times as needed. Data quality, model accuracy and overall efficiency will be verified. NB! Prototyped models are fully-functional; they can be used in daily operations within a month. Think of it as playing chess with the option to undo your previous moves! Having verified the models, further investments can then be decided on, with focus on which integrations are required and how the models might be used by operators. Their integrated datasets allow new models to be implemented within a matter of days. During implementation, datasets will be integrated according to importance. New models that have passed the prototyping and testing phases will then have the necessary integrations carried out. It’s an agile method that helps customers implement models they’ll really benefit from, and control their investments. Continuous optimisation is always taking place. When one bottleneck optimisation is done, another is appearing in a new location. So, production must be improved to meet the new demands of products, processes, customers, and technology. Data modeling is evolving rapidly and there are many new methods and libraries available. Therefore, it’s crucial to avoid vendor locks, and to have an open platform that enables the implementation of newer and better models. 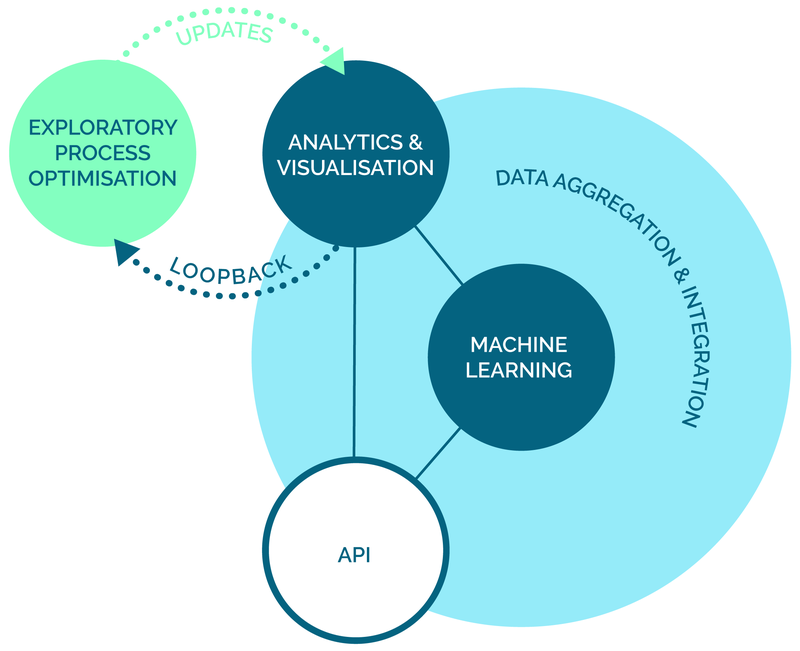 Our aim here at Proekspert is to simplify the process of adapting new analytics models. We want to enable greater benefits from available data and provide better visibility for the client with regards to what is actually going on during the production process. We realise that digitalisation must be part of a company’s strategy to really see the effects from a data-driven approach. We also understand that successful digitalisation demands a complete mindset shift, and the most effective way to achieve it is by carrying out PoC, pilots, and by prototyping. We urge companies to start with digitalisation today – yesterday even! Quick wins can easily be transformed into daily routines. If you would like to discuss things further, contact us or join our newsletter. To receive more information about simFactory visit our site.